Since a few days the weather here got bad again – not only is it raining and cold outside, we lost four straight times in the pot-limit holdem game for amounts between 300€ and 5,000€ each! The amount of rain is low compared to the tears we cry (only kidding). Still I managed to make something in the tournaments, 3rd in Schenefeld’s €200+10 for almost €1,000 and 3rd in Spielbank Hamburgs now weekly €300+15 tournament for almost €1,000 again. Katja got bad beats you don’t want to hear about and busted before reaching the money now in 4 tournaments straight. Poker was in TV again, watch it here. You just have to take that Horst Koch appears there ;). 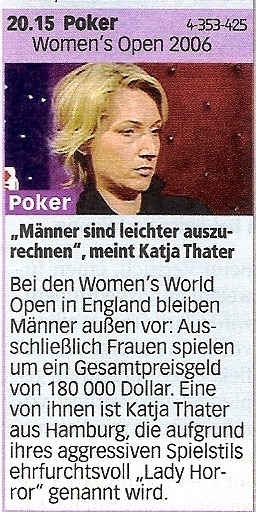 Katja’s Woman Poker Open appearance will be aired Saturday, June 3rd, 20:15h on DSF. The much more interesting heat from the “888’s Poker Nations Cup in Cardiff” will be aired also but I still have no date. In GX magazine coming out late May will be a big special about that event featuring a long interview with Katja. I got notice from some friends that there are threads here and here in some roulette-forum (german) about the black-jack tournament two weeks ago and overthere they doubt our abilities to be serious black-jack players… LOL. I also got a hate mail from one of them complaing about my black-jack tournament post last year. Instead of dizzing those lame clueless suckers experts let me state that being a “serious (=regular, +EV, know-it-all) black-jack player” is impossible in my book – count out a) a few international top-pros who manage to overcome all obstacles and b) all kinds of cheating (but not counting). In germany there are ZERO casinos spreading good enough rules to be a +EV player even if you are able to count all the stars in heaven and keep a sidecount on all the stones in a river being bound to a hostel-like torture chair. Given that, everybody placing a bet on a blackjack table (in germany and 95% other places) is bound to lose, counting or not. Now let me admit that I tried. Really. Hard. I have read numerous black-jack books, spend countless hours training obscure Zen-Counts, Omega-Counts, simple- and not-so-simple counts, studied the rules and edges, bought expensive training-software (that was when Don Smolen’s Chinese Poker software was considered modern) and did everything possible to master the game. That was before poker got so big and -releative- easy money back in 1996-1999. I think I know the game, the concepts and the possible strategies to beat play it. I was either simply not good enough or made crucial mistakes in my bankroll management – most likely both.